This article first appeared in Personal Wealth, The Edge Malaysia Weekly, on October 1, 2018 - October 07, 2018. 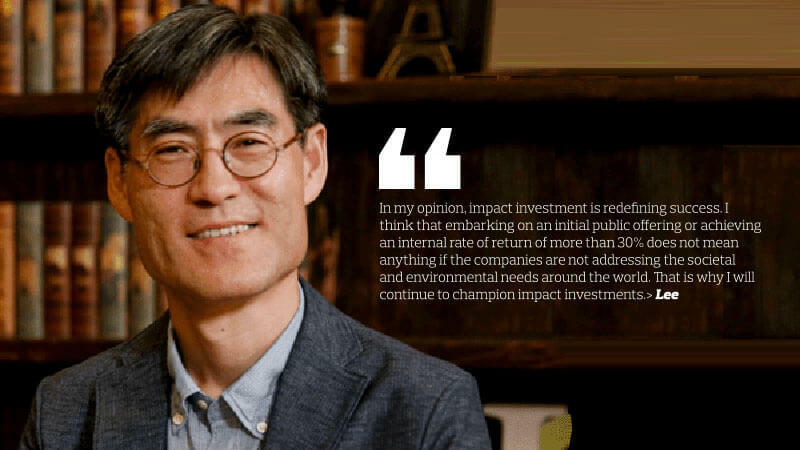 Impact investor Doug Duckjun Lee had spent most of his life as an investment banker. He had agonised over investment decisions that were made purely for profit. So, Lee was delighted to learn about impact investing — specifically, angel impact investing — because it would allow him to put his money where his heart was. To date, he has invested in more than 40 social enterprises. It all began in 2010, when South Korea’s leading e-commerce platform GMarket (where Lee was employed as chief financial officer) was acquired by eBay for US$1.2 billion. He was given a good compensation package and he was determined not to waste the money. So, he started to explore ways of making worthy investments. “I was not wealthy, but I had enough to travel and meet a lot of people. When I was in Silicon Valley, I met a lot of entrepreneurs. Some of them were very purpose-driven, trying to solve many social and environmental issues. Before long, I knew that I wanted to help these people by providing them with capital. I could finally align my values with my investments,” says Lee. He was speaking on the sidelines of the Asian Venture Philanthropy Network’s 6th annual conference in Singapore recently. But Lee decided to seek validation first. He started by connecting with some pioneer impact investors in Silicon Valley, who introduced him to Toniic — an international impact investor network. This led him to actively participate in impact investment events, looking for deals that could make a positive difference. Lee focuses his investments on companies that can provide the general population with better healthcare, education, social infrastructure and jobs. For example, he invests in Hopemakers, a South Korea-based company that offers debt counselling and refinancing for those who are financially excluded. According to Lee, not only is the credit rating mechanism in South Korea unforgiving but oftentimes, the only credit available is from loan sharks, who charge exorbitant interest rates. “These families are in a vicious cycle of working just to pay off their debts. To help them start afresh, Hopemakers provides in-depth consultations to families with low credit ratings to help them achieve a more manageable debt level,” he says. When Lee found out that the company was in need of funding seven years ago, he decided to take the lead. He started an angel investment syndicate after convincing six other angel investors to put in US$25,000 each. “The company is still operating today, although it is not very profitable. I don’t really mind because I believe it is doing something good for society. A lot of its clients were on the brink of committing suicide because they thought there was no way out,” says Lee. He also has a particular interest in renewable energy. One of his earliest investments in the sector was in Enomad, which aims to provide affordable, stable and sustainable personal on-demand energy solutions. The company’s first product — Enomad Uno — is a portable power generator that converts any type of moving water into stored energy. “The founder got the idea to start the company when she went on vacation to off-grid locations in India and saw how difficult it was to carry out day-to-day activities without electricity. She wanted to help the people in these locations experience a better standard of living,” says Lee. Lee met Enomad founder Hyerin Park when she participated in one of his accelerator programmes four years ago. At the time, she did not have a track record as an entrepreneur. She only had a mock-up of her product. But he was sold on the idea. He was so fascinated with her story and solution that he decided to become her first angel investor. “Since then, she has worked really hard to grow the company. It launched a Kickstarter campaign a few years ago and managed to raise US$500,000. The company penetrated the European market recently and last month, its product was made available in Switzerland-based department store Manor,” says Lee. As Lee believes in the impact of power decentralisation and the benefits of empowering people to generate their own electricity, he has invested in several renewable energy-related companies. One such company is SunFunder, which provides affordable loans to local solar operators in emerging markets. While solar facilities are able to generate good revenue, the upfront cost is astronomical. It is very difficult for local entrepreneurs to start solar-related companies as there are no loans available. So, SunFunder came in to close this gap. Lee thought it was a worthy investment and became one of the company’s early investors. True enough, Sunfunder has become very successful. It now serves solar product distributors, solar companies and solar project developers in 10 countries across Africa and Asia. According to its website, it has provided US$50 million worth of loans to 38 solar-related companies in more than 100 deals. “A lot of people may have heard of SolarCity, one of Tesla’s subsidiaries that designs and installs solar panels on the roofs of homes and buildings. I would like to think of SunFunder as the emerging economy version of SolarCity. It is not as fancy as SolarCity, but it solves a huge problem that exists in the solar energy industry,” says Lee. Early-stage investments are very risky. A lot of start-ups fail as they normally do not have a solid business model. When it comes to impact investments, it is even riskier because the companies’ main focus may not be financial returns. That is why Lee has his own way of assessing potential investments. “Many of the entrepreneurs whom I invested in are very passionate. When they tell me their ideas, it almost sounds as if they were destined to do this. That is the first part,” he says. That is not to say all of his investments have worked out. A handful of them did not make it. For instance, there was a carpool app in South Korea that could not grow due to the regulatory challenges. However, as his early-stage investments are typically small (US$25,000 per company), he does not worry too much about losses. As Lee focuses on long-term investments, he has not made any sizeable exits yet. Most of his exits have been small, delivering returns of 1.3 to 2.5 times his capital. His current portfolio, however, looks promising. In terms of valuations, some of the companies may even give him returns that are 10 times his initial investment. After being an angel investor for several years, Lee founded venture capital impact investment firm D3 Jubilee. He believes it is necessary to create a larger impact as venture capitalists (VCs) have more capital to distribute. “I love angel investing. There is great joy in being an angel investor, especially if you are the first person to discover, coach and grow the entrepreneur,” says Lee. “However, I do have financial limitations. The companies will continue growing and need more capital, and I won’t have the capacity to support them by myself,” he adds. Now that he is leading the venture capital impact investment firm, Lee says the stakes are high. He has a fiduciary duty to provide returns to the firm’s limited partners. “As an angel investor, I do not have the need to justify my investments to anyone. Now, I have to exercise stringent due diligence and be more prudent when making investments. I need to have a bigger role in ensuring that the companies we invest in are able to scale further,” says Lee.